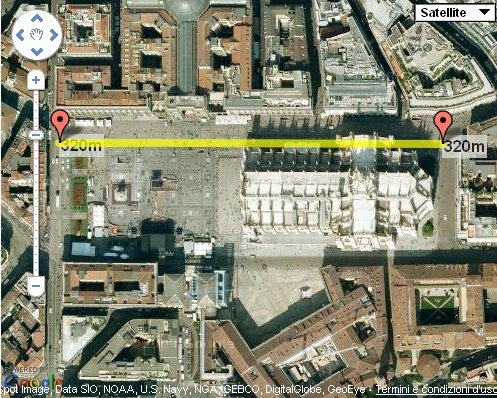 I’ve made a ruler to measure distances on a Google Map V3. The file Ruler.js contains a two function: one to calculate the distance between two points on the map with their position expressed in decimal degrees, and one function that add the ruler. Ther “ruler” is composed with two markers, a poly and two labels which show the distance. The labels are placed on the map with the Labels.js class from Marc Ridley, downloaded from his blog. Here is the link to the demo and here is the link for download it. Thanks a lot man! You saved my life. Right. I’ve fixed it. Thank you. Excellent. Good job: my congratulation. 2)the rule line binded to the objects you’re measuring the distance. Suppose we would like to continously track the distance changes among a couple of moving markers (i.e. vehicles). If I attribute an icon to the rulers then the behaviour changes ! How to change the standard icons ? Really good and handy code. If i wanted to change the distance to miles would this be correct? How do you remove a ruler? Very nice, i also though want to know how to remove the ruler ? Thank you very much for the code. We have a situation here where we need to do site surveys, and to help our salespeople I have set up a Google map they can add markers to. However, I took your code one step further, and thought I’d share. This version of the code stores the rulers in an array and outputs a line for each one where our salesmen can put in the other information we need. At the end of each line, there is a “Delete Ruler” button. It deletes the line and the ruler from the page. // Quasi global array of all of the lines we've added. // This function adds a line to our page. // Now we remove the ruler. // I've unpacked the variables for readability. Again, thanks for publishing this. You saved me a day or two. Long story short, there was a bunch of HTML in here. Longer story shorter, you don’t need it. So that the event handler attaches the button to the right ruler. to the end of the addruler function.